“I know that this team of prefects can overcome anything through teamwork." Newly inducted Veiuto Primary School head girl Falepaini Ofa Puamau is ready to come out of her comfort zone and lead the school. 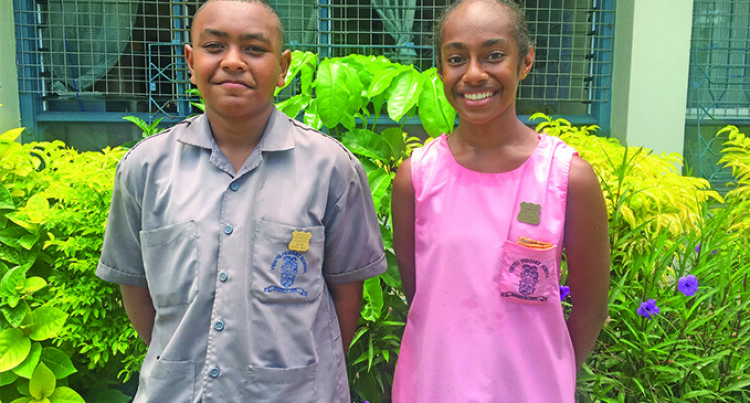 She made the comment after the prefects’ induction ceremony at Suva Grammar School Hall on Friday. The 13-year-old said it was an honour and privilege to serve the school and help the students to maintain discipline. “The struggle I face is some children do not listen and do not follow the school rules. I will bring it to the attention of the teachers,” Falepaini said. She maintained that she was honoured to be given the responsibility and was ready to carry out her duties and be a role model for students. The Caubati, Nasinu, resident paid tribute to her parents for her upbringing and for imbuing her with attributes needed to perform the role. Falepaini has set plans for her future. She is thinking of attending Adi Cakobau School or Saint Joseph’s Secondary School and wants to be either an accountant or a doctor. Meanwhile, newly inducted head boy Timoci Gadolo said he was nervous about the role, but he knows he has to step up and be confident and humble. “I know that this team of prefects can overcome anything through teamwork,” he said. Timoci wants to be a pilot when he leaves school.